Hey, it's Peter from NYCeWheels. And he isn't even breathing hard. Let’s overgeneralize for a moment. When you think about high-quality business-to-consumer video marketing, who is responsible for the real heavy-lifting? The main company? Or its dealers? Is it Proctor and Gamble? Or Cub Food in Freeport, Illinois? Is it Ford? Or Dennison Ford in Bloomington? I’m thinking P&G and Ford. All you have to do is watch TV. It’s obvious that the main companies put a lot of resources into video. And when you see video at the local level, you recognize it as a different category. It’s not bad, necessarily, but it’s definitely local. Yes, I know it’s a YouTube world. But that doesn’t mean that quality isn’t important. In fact, with all the dreck out there, quality is more important than ever. That’s why it’s so interesting that when it comes to using video to sell bicycles, one of the best practitioners of the art is a bike dealer, not a manufacturer. New York’s NYCeWheels is a specialty shop selling folding bikes, electric bikes and, ta da, folding electric bikes. 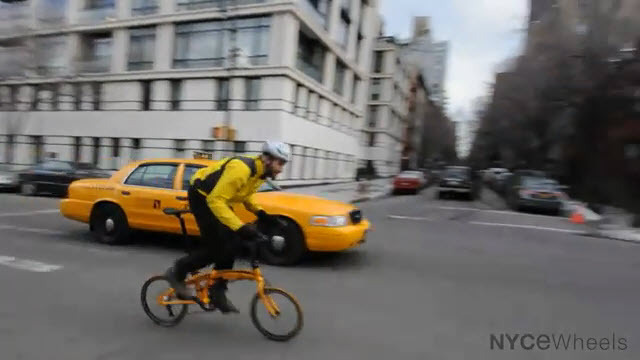 And, correct me if I’m missing somebody, but I’d say NYCeWheels turns out the best Brompton and Dahon videos out there. Just today, I got a link to their video on the Dahon Vector X27h. It follows a typical pattern for a NYCeWheels video (for one thing, the NYCeWheels brand is always visible). "You can throw this bike right into the trunk of your car." First, you see “Peter from NYCeWheels” on the bike in New York (always helps when you’ve got a dynamic stage setting). You get an intro to the bike from the rider in motion – this particular Dahon is a “high-performance road-bike-style folding bike” – then a few more details while the ride continues. Peter stops in a park and you’re shown how the bicycle folds and unfolds. Then he revisits the bike’s mission statement; invites you to watch other NYCeWheels videos and come to the shop to take a test ride. Then he rides away. Great sound, great video, great product demonstration and a call to action, all in 2:35. It just doesn’t get any better than that. 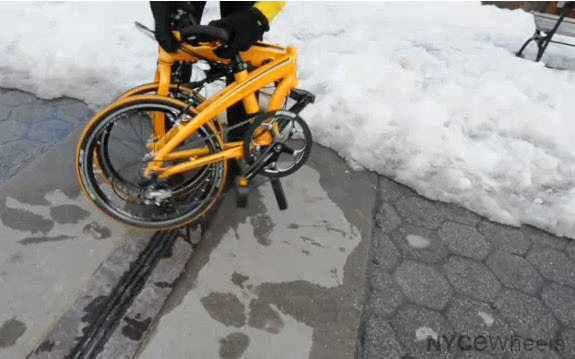 This entry was posted in Brompton, Business, Dahon and tagged marketing, New York, product demonstration, quality, video. Bookmark the permalink. Well that’s flattering, thanks! I’m really happy that people seem to appreciate all the work we’re putting into the videos. They are definitely fun for Bert and I to make. Hopefully more than being beautiful they are a useful way for people to quickly digest information about the bikes we carry without getting bored. We are always learning how to make them better and producing one a week without fail is good practice! Thanks again and stay tuned for the Vector X10 video review coming out next week. Now that’s a sweet folding bike! Thanks for reading my article, Peter. You’ll note I corrected the piece after seeing your contact information. I could stand to pay a bit of attention to the brand myself. Don’t mean to ask you to give away any trade secrets, but how are you mic’d on the bike? Great article. And great videos. I totally agree nycewheels is doing a great job. The videos are well constructed and shot and Peters engaging and natural presentation gives the message great credibility. You don’t feel like you’re being sold which is the real power of this kind of video marketing. Keep it up and keep on those quirky details that make it real.